Nearly five years ago, when I started this blog I really had no idea why I was doing it and, in the early days, barely anyone read it. I hadn’t even told my friends and family about it so my hits sat at zero. But gradually people started to drop by, and they would leave me comments and encouragement. It was then that blogging made sense to me. I’ve always been a writer – it’s how I make my living and even before I left university to get a real job finally getting paid for assembling words, writing was something that I’d always done. Like most writers, there’s always been the assumption that one day I’d write a book and I have that half finished novel sat on my hard drive waiting to be completed. I’ve read a lot of books about running, I have a shelf full of them: Born to Run, What I talk about when I talk about running, Run, Running for Women, the list goes on. The idea that I’d write a book about running, though, was a preposterous one until about a year ago. More and more people stopped by here and told me that they’d started reading the blog from the beginning and I started to look back on those early posts with a bit of embarrassment. They’d been dashed out after a run as little more than a record for myself to look back on. I wanted to go back and rewrite them. I was on a bus in Australia when I decided to write The Lazy Runner. More than being just my story of how I went from lazy couch potato to completing five marathons, it offers practical advice for anyone attempting the same journey. I got an email from my publisher telling me that they were going to publish it while I was at the Olympics this summer. 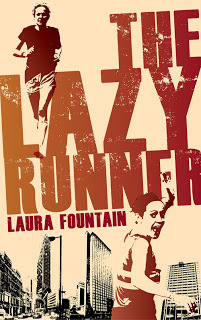 The Lazy Runner is out now as an ebook. Read what Glamour magazine had to say about it. Thank you to everyone who has stopped by over the past few years. Sometimes I’m not sure whether the blogging kept the running going or vice versa. The comments you all left have definitely helped keep both going though. The Lazy Runner is available on Amazon, and the iBooks store as well as the Kobo store and anywhere else you might buy your ebooks from. Many congratulations! I enjoy your always-entertaining blog, so am delighted I can look forward to reading more of your writing. Ah, thanks guys. I hope you enjoy it! Amazeballs! Congrats. Great cover design as well. I’m a new reader of your blog, Laura, but really enjoying it so far. Looking forward to reading the book when it’s out! Wow, congratulations! Can’t wait to buy a hard copy to add to my collection of running books. A BOOK! A BOOOOOOOOOOOOOOOOOOOOOOOOOOOOOOOOOOOOOOOOOOOOOOOOOOOOOOOOOOOOOOOOOOOOOOOOOOOOOOOOOOOOOOOOOOOKKKKKKKKKKKKKKKKKKKKKKKKKKKKKKKKKKKKKKKKKKKKKKK! YOU WROTE A BOOKKKKKKKKKKKKKKKKKKKKKKKKKKKKKKKKKKKKKKKKKKKKKKKKKKKKKKKKKKKKKKKKKKKKKKKKKKKKKKKKKKKKKKKKKKKKKKKKKKK! This is super cool. Can’t wait to read it! Fantastic! Can’t wait to read! You know I take personal credit for your sub 4 marathon. My tough love comments way back regarding less drinking, more focus and getting your head in the game…I think it helped! :-) So happy for you! Susan – good to see you’re still checking in on me. You’ll have been pleased of my month without drinking in preparation for Venice marathon! Possibly harder than the race itself. I am so enjoying your book right now! I am taking the plunge and running my first marathon in Sept ’13, and this book is really giving me much-needed encouragement and some great laughs! Only just started reading your blog and bought your book last night. Its really good and I can’t wait to get back to reading it tonight! I just found your blog, and you literally sound exactly like me. I have always loathed running. I started about 5 months ago and I absolutely love it now. I am the obsessed running girl that I used to make fun of. I too am a writer. I can’t wait to read more of your blog. Thanks!